What is Nissan Express Service? Call Mossy Nissan Chula Vista at (866) 470-8528 or Mossy Nissan El Cajon at (619) 866-6396 or Mossy Nissan Escondido at (888) 714-0768 or Mossy Nissan National City at (855) 295-5292 or Mossy Nissan Oceanside at (866) 991-9309 or Mossy Nissan Poway at (877) 666-4250 or Mossy Nissan Kearney Mesa at (858) 227-3355 to schedule your Express Service appointment. All Nissan Express customers will be allotted a fixed appointment date and time. Punctuality is of utmost importance to ensure no unnecessary delay. Personalized Customer Care by Service Advisor from vehicle intake till delivery. Each customer shall be alloted a dual-technician work bay to ensure job completion within promised time. Customers can wait and relax at our exclusively designed cozy lounge while we perform the maintenance services. 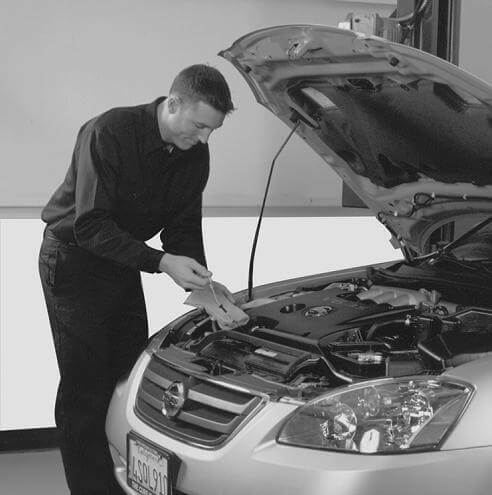 Mossy Nissan is a full-service maintenance and repair center. We recommend using authorized Nissan service and genuine Nissan parts that we have designed for their reliability, safety and suitability for your Nissan vehicle. We are committed to providing you with quick, efficient and competitively priced service and parts. Every Express Service Oil & Filter change will include a Multi-Point Inspection and be completed in 30 minutes or less-- or your Express Service Oil & Filter change is free*. It's our promise to you. Introducing Nissan Express Service available at all 7 Mossy Nissan locations. The same expert service you've come to trust only faster and more convenient. *30 minutes begin when Repair Order is signed by customer. Using Genuine Nissan Oil Filter and multi-grade oil up to vehicle specification. Nissan vehicles only. Excludes hazardous waste fee, tax and shop supplies, where applicable. Include hazardous waste fee in California. Offer not valid with previous charges or with any other offers or specials. Offer has no cash value. Customer must present offer at time of write-up. Valid at Mossy Nissan Oceanside, Mossy Nissan National City, and Mossy Nissan Poway only.